At the Fall Fashion Preview Party for GQ and Lucky Magazines the huge crowd at Banana Republic’s SoHo location was friendly, diverse and fashion-forward (“Is that an ascot?!”). 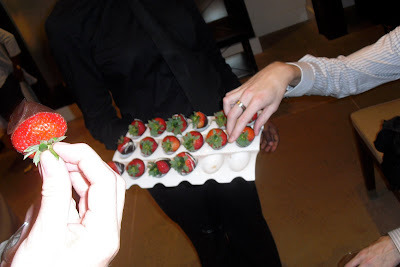 In addition to the 25% store discount, guests enjoyed complimentary wine, champagne, and hors d’oeuvres. When I walked in, the store looked immaculate, and the lighting was spectacular! There was a live DJ spinning and plenty of staff on hand to help shoppers. The night started with a brief welcome followed by a fashion show featuring Banana Republic clothing and style commentary from GQ’s Brett Fahlgren and Lucky Mag’s Lori Bergamotto. The highlight of the evening was when a Banana Republic representative announced their new personal shopping service! Now, customers can set an appointment with an expert to help them choose items that best fit their style. The only downer was that they ran out of alcohol around 8.